Trams and Kolkata are almost synonymous — the city has trams so finely etched in its character that ‘Kolkata Trams’ is a phrase heavily loaded with images, meanings and feelings spanning a range of connotations. In the beginning, trams were pulled by horses and that beginning was the year 1880 and almost a century and a half later trams still resonate in the city, albeit with the support of loyalty alone, if nothing else. The romance of trams has been immortalised in celluloid since Satyajit Ray’s Mahanagar (1963) to Yuva (2004) and Kahaani (2012 & 2016). And the tour operator of your Kolkata trip will never dare drop a tram ride from your itinerary. For all those ‘probashi’ souls and every motor or period aficionado worth his/her salt, trams spell romance and nostalgia, all rolled into one. The leafy, shaded routes may be missing, and you might see the trams run through the middle of congested roads, bullied by gas guzzling and smoke spewing, spiffy cars but still the trams run sure, they run proudly for they remain the only clean mode of public transport. The city and its denizens may have ignored trams but they are a gem waiting to be called on their brilliance. The Calcutta Tramways Company hauled the tramcars by horses through Calcutta’s (as known then) serpentine streets in the early years. It was only in 1905 when electricity powered the system and by 1943, tram routes covered a 67 km stretch in the city. Until the 90’s trams catered to a range of commuters neatly divided by timings starting from the maiden morning run at 4.40am, this was mostly availed by passengers destined to catch trains at Howrah station. The next segment of commuters would be the pious at heart en route to their daily dip in the Ganga, then came the school goers and finally, the rush hour witnessed the ‘babudom’ crowding towards Dalhousie Square. Running on lines embedded on grass patches, the trams would run on with twinkling bells as they hugged the extreme sides of a road. In 1967, trams and tramways came under the state government and the gradual downfall started for Kolkata trams. A whopping 32km stretch was either shut down or closed temporarily with no let down in sight. Construction of flyovers, the introduction of the metro rail project, burgeoning numbers of auto-rickshaws, buses, and cars pushed Kolkata trams out of the race. In fact, road widening projects swallowed the green patches of tramlines so that lines now ran in the middle of the road with roaring traffic around. The result — commuters dwindled and peak hour for trams became an obsolete term. More than 450 trams ran in the 80s while today only 40 odd tramcars run on a regular basis in the remaining 8 functional routes. Bombay, Delhi, Karachi, and Madras do not have trams anymore, though they were introduced in these cities too by the British. But trams in Kolkata trudge on exuding the old-world charm and refuse to roll down into the sunset. But the quaint tram is often seen as an eyesore in the fast transport needs for the city. So, the pride of Kolkata is given immemorial heritage status. The oldest running electric tram system in the whole of Asia is now a museum and a cafe. The Esplanade depot is now a tram museum with a 1938-built coach turned into a museum housing all the related paraphernalia that will make every history enthusiast chuckle with glee. Kolkata trams are now also being lent to private tour operators, media houses for production and even event management companies for hosting soirees and weddings! Heritage runs with cosmetic changes to the coaches and AC versions have been inaugurated with gusto. Luxury tram rides in winters promise a seven hour joy ride around the city. Though heritage runs have been slow to gain favour, the administration thinks it’s just the initial hiccup. The fast-paced city might be leaving its old friend behind and many people are claiming that the trams are moving towards a natural death. But the trams do have their dedicated champions. There are so many arguments on behalf of the tramcars that nostalgia alone cannot cut it. It is both logical and economical for the city that trams continue. With dedicated grass-patch corridors, trams run with 40 km per hour speed compared to the average vehicular speed of 12 km per hour in congestion and peak hours. While Kolkata sees its iconic trams struggle for existence, the world over trams are making a comeback. The reason being the most crucial ‘green factor’. Trams are the cleanest, non-polluting mode of transport today. For a city like Kolkata, which is straining to breathe some clean air and desperately trying to fend off pollution from vehicular emission and construction activities, trams are the obvious solution. As the trams trundle by with their familiar clanking gait, beneath the aerial tangle of power lines running the narrow thoroughfare of Lower Chitpore Road, or saunter in their reptilian charm in the midst of the maddening human jungle of Howrah, or make a graceful arc along Red Road or crawl through the debris of Chowringhee, it is hard to imagine them in their heyday. Above everything else perhaps, is sentimentality. 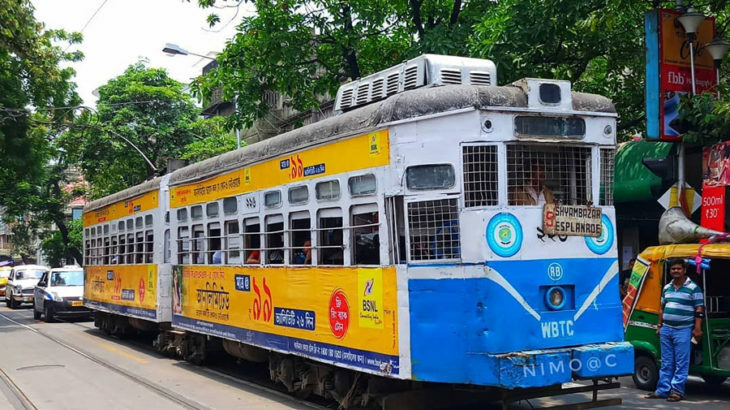 It is indeed one of the major fuels behind trams, as Kishori Lal Chowbey, a tram driver from UP in his late 30s, explains, “Calcutta people love their trams… it’s not just a transport system for them. It’s a part of what makes this a city they have loved and known all their life.” He couldn’t have been more right! In a city burdened by civic realities and poor service integration, trams remain a heroic survivor with equal doses of nostalgia, pride, and practicality.